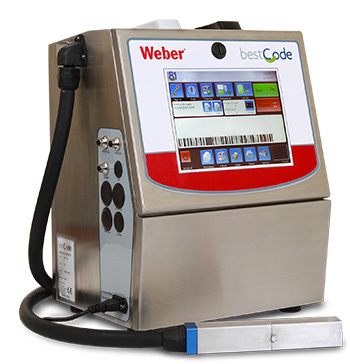 Weber Packaging Solutions is pleased to introduce the latest innovations in the BestCode Series 8 continuous ink jet systems called Next. • Increasing print speeds to ultra high speed specifications. Advanced CleanStart™ extends operation times by automatically cleaning printhead - eliminating daily and weekly cleanings typical in coding machinery. You can spend more than 500 operation hours between human interactions. Automated End-of-Day Coding and Marking Routine. BestCode’s AutoOff™ Go Home Button is used at the end of the workday. Pressing the AutoOff™ Go Home Button automates the time consuming end of day manual routines by automatically cleaning the printhead and powering the system off. Press the button and go home – no wait time or manual cleaning to go through. New Level of User Simplicity. Next Series 8 Systems are simplified for the user, allowing anyone to operate and minimizing operator touches and extending time between human interaction. A large, 10.4” color touch display is always on, offering a vivid display with large intuitive buttons and status indicators. The Series 8 display allows easy visual making full use of the color for status indicators. OneTouch™ single step operator functions are in use throughout the interface to reduce operator steps. A true WYSIWYG environment provides the most realistic view of creating your print message. Small and Large Character Marking and Coding. Print marks and codes as small as .025" (.6 mm) – print on the edge of a toothpick or paperclip, and as large as .75" (19 mm) – print on the side of corrugated cases and other large character applications. Print non-contact, immediate dry, permanent, high-speed, reliable marks and codes on a wide range of substrates, including plastic, glass, paper and more. BestCode’s true non-contact printing allows ink throw distances at a minimum .5” (12mm) and up to 2” (50mm). Ultra High Speed Print Capabilities. 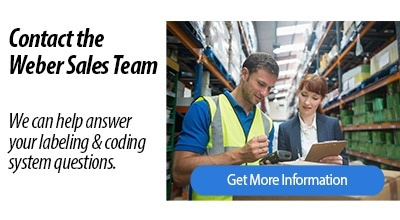 Multiple machine types and multiple speed settings enable BestCode systems to achieve the fastest print applications. A single line of text can print at speeds exceeding 2000 feet/minute (600M/minute), two lines over 600 feet/minute (200M/minute), three or four lines of print at 300 feet/minute (100M/minute).